A family favorite turned into a salad. Preheat grill to medium-high heat. Preheat oven to 400°. In a medium bowl, combine 1 tablespoon vegetable oil, shrimp, oregano, garlic powder, onion powder, cumin, paprika, chili powder, ½ teaspoon salt and 1 teaspoon pepper. Marinate for 10 minutes. Grill shrimp for 2 minutes. Turn and continue cooking until shrimp are opaque, reserve. In a medium bowl, toss 1 tablespoon vegetable oil, remaining salt and pepper and vegetables. Grill vegetables on a grill skillet until softened, about 6 minutes. Lightly toast tortillas on grill 30 seconds per side to soften. In a medium bowl, toss the tortillas with 1 ½ teaspoons oil. Place the tortillas into a 12-cup muffin tin and bake for 15 minutes or until crisp. In a large bowl, combine cilantro, lime zest and juice, yogurt and salt and pepper to taste. Toss the shrimp, vegetables, dressing, lettuce, avocado and tomatoes. 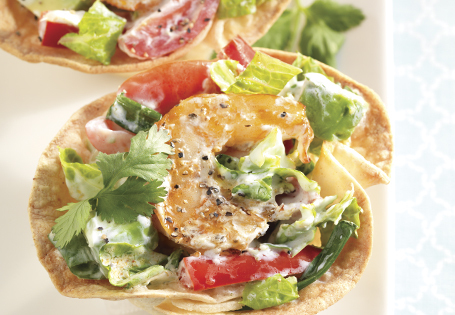 Serve the salad in the baked tortilla shell.